This Economical Table Skirt Adds Elegance and Professionalism to Trade Show Booths! Get Custom Printed Covers and Throws, As Well! Purchase This Pleated Table Skirt for Less Online! 21-1/2' table skirt for rectangular or round tables. Box pleated style giving your cloth a finished look! Hook and loop attachment for quick and easy installation! 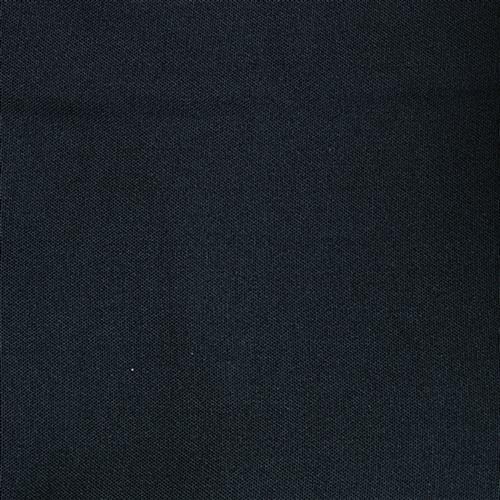 Black polyester skirting easily complements any environment. Searching for an economical way to dress up your table? This table skirt is definitely the best solution for you. The 21-1/2' long skirting completely covers an 8' table and 3-sides of a 16' rectangular table, leaving the back open for workers to sit behind or store boxes underneath. 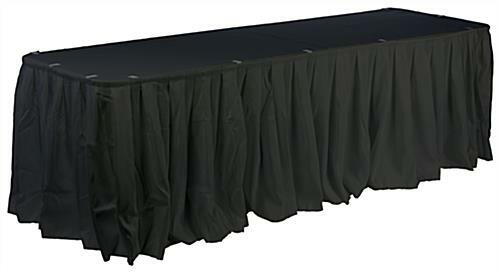 A cover, table skirt also fully wraps a 72" round configuration. 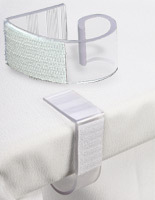 A tablecloth is sewn with a hook and loop strip on the back to easily attach it. 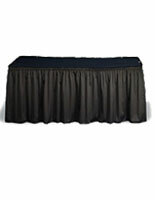 The table skirt is made with an attractive box pleating style, which gives your table a more uniform appearance. This table skirt, such as a cover and tablecloth, is a great addition to any formal or social gathering, like business meetings and hotel functions. Make your presentation more attractive and professional with throws. 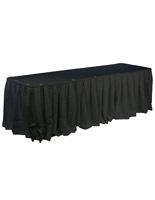 You can often find this table skirt set up in hotels and schools, as well as at trade show events, conventions, or ballrooms. Why rent a one-time-use cover when you can get this item at an inexpensive price! 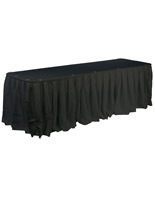 The polyester fabric of this table skirt allows the user to wash and re-use it for other events!